Here they are - the Topps All-Star Rookie Team, selected "by the Youth of America" following the 1974 season and featured in the 1975 Topps set. I have completed the run of these up through 2018 Series One, at least all regular issue cards that bear the All-Star Rookie Trophy. 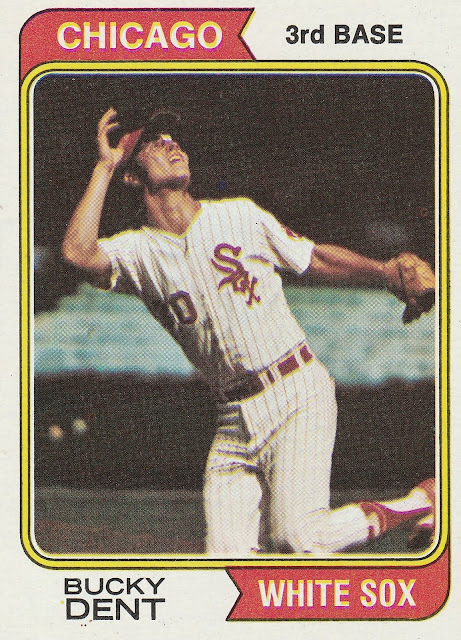 Topps decided to skip the Trophies on the 1974 Topps Set, but they made a triumphant return in 1975. I wanted to show my appreciation for this expression of good judgement, so for the 1974 Lineup, I will do a separate post for each player. This was a pretty good crop of players, so let's dive in! Bucky Dent was the 6th overall pick in the June 1970 MLB Draft, though he had already been drafted twice before by Saint Louis without signing a contract. Dent would agree to sign with the White Sox and became the heir apparent to the position long held by Hall of Famer Luis Aparicio on the South Side of Chicago. Whoa - Thanks to this card, it has been revealed that the Youth of America have been disenfranchised! The Rookie All-Star team is now voted on by MLB players. 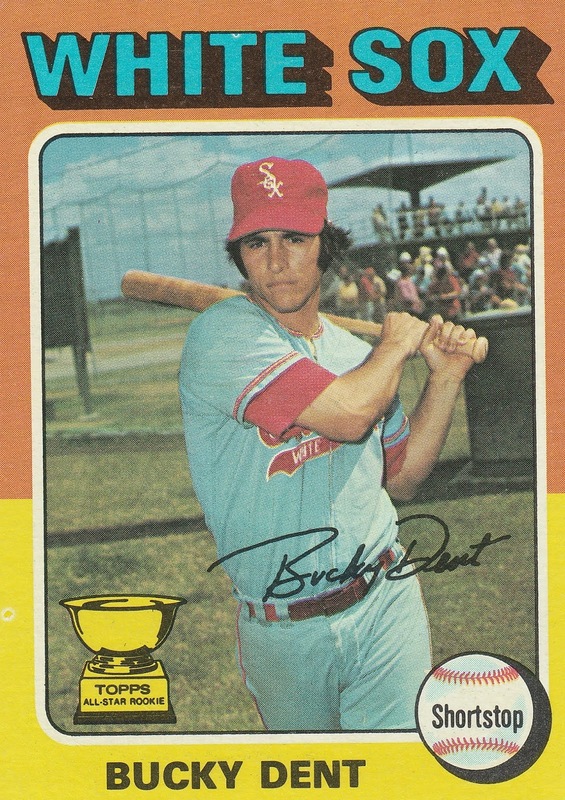 Dent began his White Sox career at just 21 years old. In his first full season, he finished second in the AL Rookie of the Year voting, and led the AL in Sacrifice Hits. His batting average of .274 would be a career high. Expectations for Chicago Shortstops would always be high - whether the player is trying to replace Aparicio or Banks. Comparisons would never really go away. 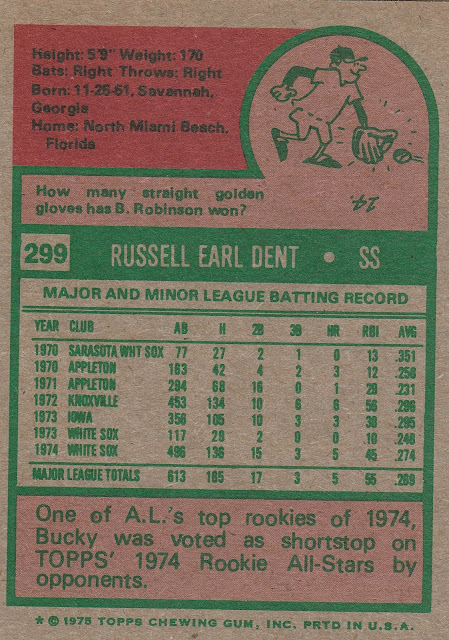 He did make his first All-Star roster in 1975, this time as a reserve. 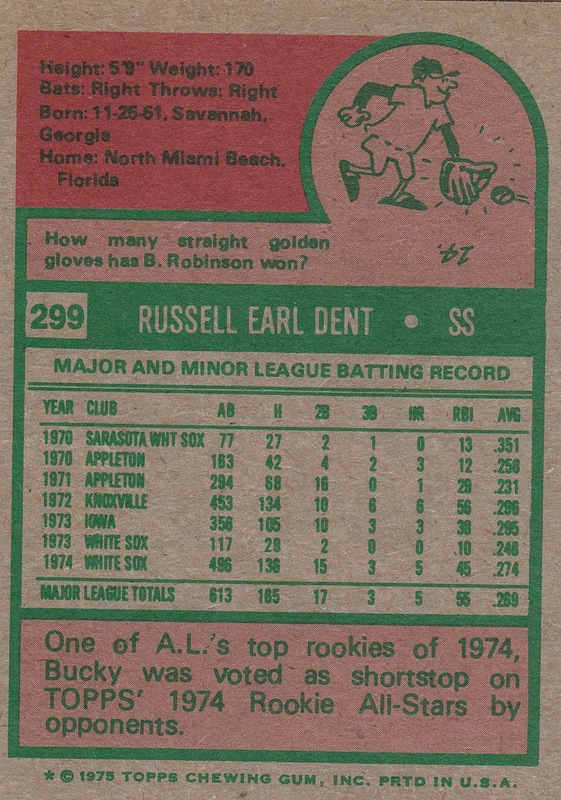 He would enter the game as a pinch hitter (batting for Reggie Jackson), and struck out. Sharing this for the cartoon - Dent's family history was complicated, I don't want to make light of it. You can read all about it in his SABR biography. 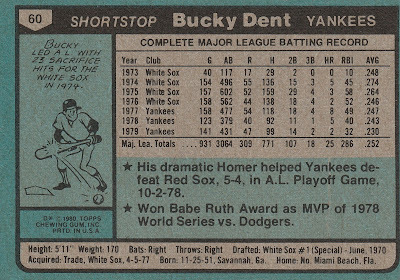 While Dent wasn't exactly setting the world on fire at the plate or in the field, there was a intangible quality to his play on the field, and it was that "grit," "heart," and/or "hustle" which appealed to the New York Yankees. The Yankees gave up Oscar Gamble, LaMarr Hoyt, a minor leaguer and $200,000 to get their new Short Stop, and both teams went away thinking they made out like bandits. 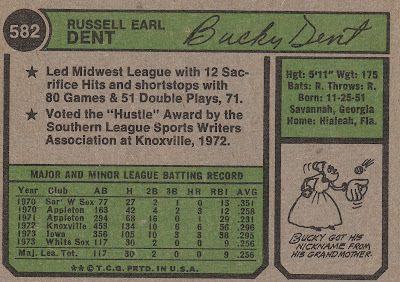 Dent would continue to play regularly at short, and despite mediocre statistics, he was widely regarded as a team leader. 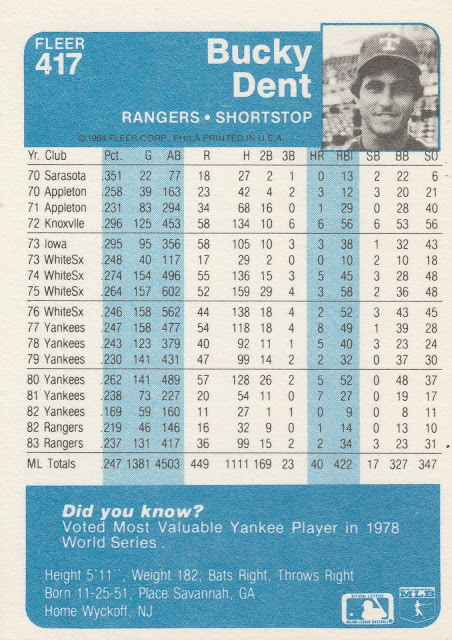 I won't bore you with the details, but he's given much of the credit for the Yankees' 1978 World Series victory over the Dodgers -- He hit .417 and drove in two big runs in the deciding 6th game. 1978 of course was his 2nd World Series victory, the first coming the year prior. 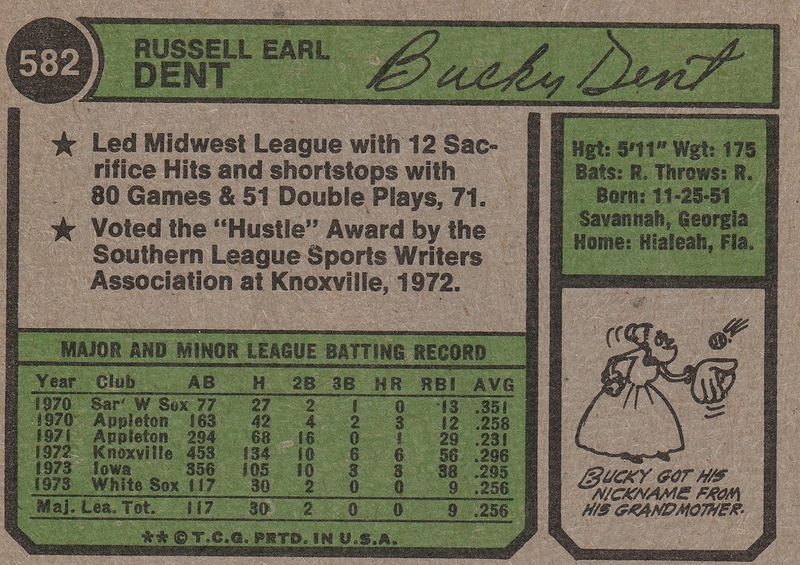 Dent would be on the move again in 1982, traded to Texas for Lee Mazzilli following two straight All-Star appearances. In Texas, Dent would find it more difficult to get those fan votes. 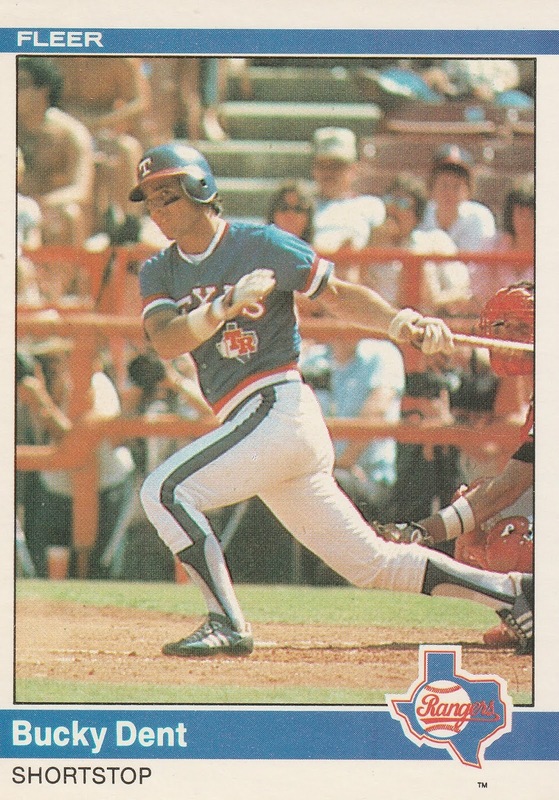 His time in Texas was unremarkable. If not for his above average defense, we would have been an exactly replacement level player, earning 0.0 offensive WAR. 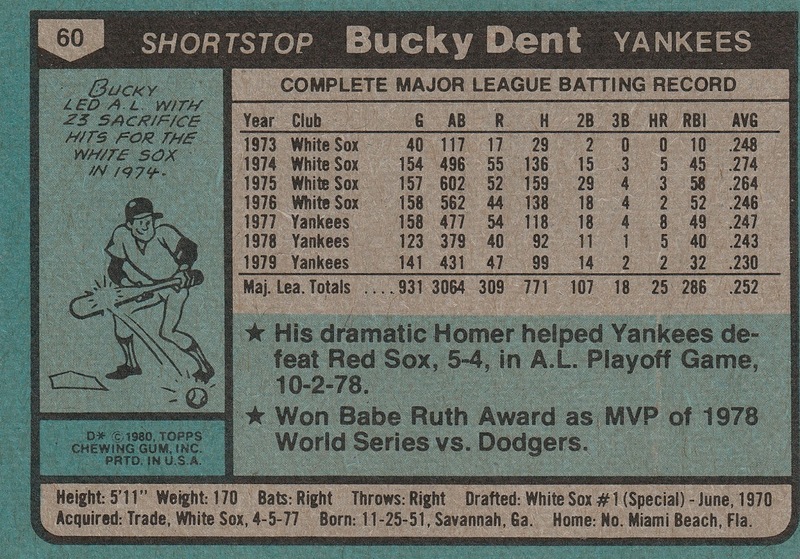 In 1984, Dent was released by the Rangers in April. He was granted a mini-reunion in New York - the Yankees signed him in June. He would not appear in a single game and was granted his release in July. The Kansas City Royals called, and he played his final 11 Major League games in the City of Fountains. 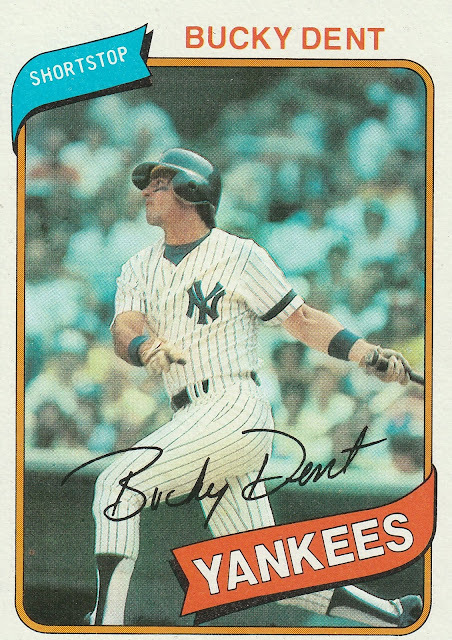 After his playing career ended, Dent would return to the Yankees as minor league manager, moving quickly from single A to AAA. He briefly managed the major league team at the tail end of 1989 and the start of 1990, but was caught in George Steinbrenner's coaching carousel and was fired early in the 1990 season. He would join Joe Torre's staff in Saint Louis with the team that originally drafted him from 1991-1994, then coached in the Rangers system until 2001. Can't get enough of seeing those stirrup shots. I miss seeing them on current players baseballs cards.